Arizona Injury Medical Associates is a premier workers compensation doctor clinic and also handles personal injury treatment. The practice offers all types of pain management services including medication management, physical therapy, medical acupuncture, interventional pain treatments and also performs EMG’s and NCV’s. When it comes to neck or back pain, one of the most frequently performed procedures are medial branch blocks. Here are some FAQ’s on the procedure. The term block refers to an injection designed to inhibit nerve transmission. 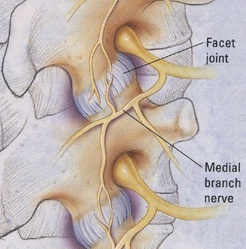 The medial branches are small nerve endings that supply sensation to the facet joints of the spine. this includes the cervical, thoracic and lumbar spine areas. The facet joints of the spine contain articular cartilage just like the hip or the knee joints. Therefore, they are prone to arthritis, which can produce pain that a person experiences on a daily basis. In addition, a work injury or car accident can damage these tiny joints, which can then spark up immense chronic pain. Treatment with an AZ or federal workmans comp doctor can alleviate this pain with a medial branch block. Each spinal joint receives sensation from two medial branches, therefore the injection involves placing pain medicine in two places around the affected joint. Why is a medial branch block performed? Medial branch blocks are performed for two reasons. The first reason is for diagnostic purposes, while the second reason is for therapeutic pain relief. When a workers compensation pain management doctor suspects that the patient’s pain is coming from one or multiple facet joints, a medial branch block may be performed to confirm the suspicion. 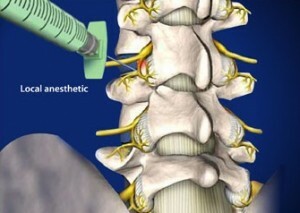 if the injection provides significant pain relief, then that joint can be deemed to be a pain generator for that patient. Medial branch blocks are performed around the affected joint in 2 places. Most pain doctors now utilize fluoroscopy for these injections, which is a real-time form of x-ray. Once the doctor has the needle around the facet joint in the region of the medial branches, contrast is injected to verify accurate placement. Once this is confirmed, the pain doctor will inject some numbing medicine and possibly a bit of steroid medication as well. After the procedure, patients are monitored for a short time to make sure the vital signs are stable and no allergic reaction occurs. What are the typical results of a medial branch block? If the suspected joint is actually causing the patient’s pain, the medial branch block will typically provide immediate pain relief. interestingly, even medial branch blocks with only numbing medicine may provide pain relief for upwards of a few months. For these patients, the diagnostic and therapeutic reasons for the injection are both satisfied. For an individual who has been out of work due to back or neck pain from a facet injury, the medial branch block may allow a return to work. With an auto accident injury doctor such as Arizona IMA, this happens very frequently. What can be done if a medial branch block pain relief wears off? If the patient has success with a medial branch block and the pain relief subsequently wears off, the next step is either a repeat of the medial branch block or an injection into the joint itself – a facet block. A repeat medial branch block can again provide months of pain relief, and make it so that daily back or neck pain doesn’t occur, or keeps it a low baseline level. An injury or workers compensation doctor can treat the patient with medications, PT and acupuncture as well if necessary. What are the risks of a medial branch block? The risks of this procedure are very low but real nevertheless. There is a very small risk of infection, bleeding, nerve injury or allergic reaction to the injected medication. Your pain doctor will discuss these risks in more depth prior to the procedure.